South United’s winless streak continued in the Hero Second Division League as they crumbled to a 4-0 loss to Fateh Hyderabad AFC. Trailing 2-0 at the 50th minute mark, SUFC pushed forward to claw their way back in the game and conceded two late goals on the counter. 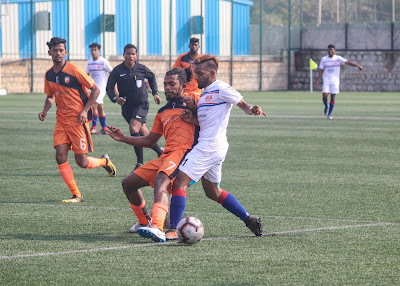 The early action in the first half saw both teams trading blows as South United FC created a chance at one end only for Fateh Hyderabad to create one down the other. The closest South United FC would come to a goal in the first half was when Sudipta’s attempt came off the crossbar midway through the first half. Naro Hari Sreshtha who struck the telling blow for the home side though with his goal in the 29th minute giving his side the advantage and leaving SUFC to chase the game. South United spent the rest of the half creating chances but couldn’t get too many shots away that threatened the Fateh Hyderabad goal. With the sides walking in at halftime with the home side leading through a slender 1 goal lead, the game remained in the balance. The second half began poorly for South United FC as they were 2-0 behind in the first 5 minutes through Gagandeep Singh. The following 20 minutes were South United FC throwing all they had forward to get the all-important third goal in the game early so they could find a way back in the game. Fateh Hyderabad’s sturdy defence rode out the tough part of the game and started to get a better foothold in the game. The urgency for South United FC to throw men forward meant more space for Fateh Hyderabad on the counter. Substitute Bedashwor Singh took advantage of that in the 87th minute to make it 3-0 and put it virtually out of reach for SUFC. Another substitute, the Australian Emile O Damey stepped up to the spot to put away a penalty in the 89th minute to cap off the win.